Europe's stronger economies should avoid imposing drastic budget cuts at the expense of growth, a report by the International Monetary Fund has said. If things worsen in the UK, Germany or France, they should "consider delaying" cuts, because they can borrow "at historically low" interest rates. The IMF also warned that a recession in Europe in 2012 could not be ruled out. Separately, a Markit PMI study said the eurozone's service sector shrank for the first time in two years last month. The IMF's warning came in its latest 100-page report on the economic outlook for Europe. "Finding a durable solution to the euro area sovereign crisis has become more than overdue," the IMF said in its report. "(This) will require some difficult decisions to improve crisis management and a demonstration of unity behind the project of economic and monetary union that will convince markets. "The pursuit of nominal deficit targets should not come at the expense of risking a widespread contraction in economic activity," the IMF said. "If (economic) activity were to undershoot current expectations and risk a period of stagnation or contraction, countries that face historically low yields (for example, Germany and the UK) should also consider delaying some of their planned consolidation." 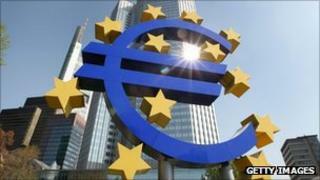 The IMF's Europe director, Antonio Borges, said that Europe had edged closer to recession. "We still predict growth in 2012, but very modest," he said. But if economies go into reverse "all those countries with fiscal leeway might want to consider" changes in fiscal policy, he said. The weakness of the eurozone's economic recovery was underlined in data from the latest Markit/CIPS Services Purchasing Managers' Index. For September, the index fell to 48.8, from 51.5 in August, its lowest reading since July 2009. A reading below 50 indicates contraction. Markit said that a service sector downturn that began in smaller members of the 17-nation eurozone had spread throughout the bloc. "The malaise is spreading to the core, where surging rates of expansion earlier in the year have turned rapidly into contraction in Germany and only very modest growth in France," said Chris Williamson, chief economist at Markit.